Store your "thousand gold coins" in this festive and charming Maneki Neko lucky cat bank. Three Maneki Neko cats of different sizes appear together with the biggest cat in the center. The biggest cat also holds several large gold coins which reads "Thousand Yen" while the gold coin on its right reads "Good Fortune". Each cat wears a red, black and gold striked collar with a golden ornament; the largest-sized cat features a golden coin on its collar reading with a green sparkling bib that says "fortune", while the medium sized cat wheres a blue sparkling bib with a gold going reading "Longevity". The smallest of the three wears a simple gold bell on its collar. All three cats are a polished white tone with red ears, calico spots of black, orange and yellow, and golden accents. A horizontal slot in the back of the figurine allows for the deposit of coins and bills in this lucky cat bank. With their paws up in a beckoning position, these Maneki Nekos will only bring you fortune and good luck. 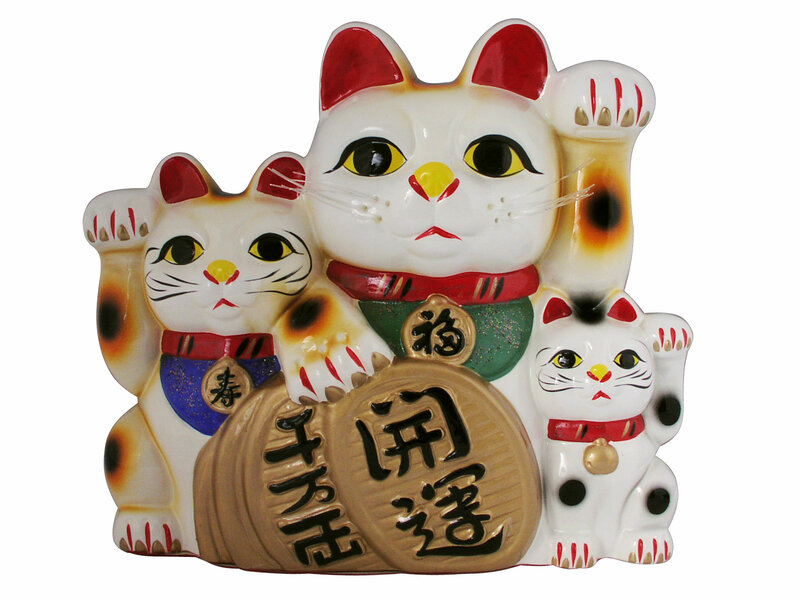 Perfect as a gift for a family business, this lucky cat bank is also a great tip jar to display in businesses. Made in Taiwan. Received my Maneki Neko in excellent condition. Wrapped carefully. It is beautiful. I love the the sale people; they were very professional and helpful. I will definitely buy again. Thank You. This was a Christmas gift given to a friend. It was very well received and to date, seems to be working as her business is starting to pick up. ConsThe slot for the bank is narrow. I attempted to place a silver dollar in the bank, but the slot was too narrow. Instead, I had to use regular coins. I love Lucky Cats with their unique gifts like Love, Wealth, ect.... I want the three white cats for my birthday this year. But it seems that its OUT OF STOCK!!!!!! !